Scattered smaller hillside farms, small to medium-sized irregular fields from piecemeal woodland clearance, with some residual woodland. Part of the medieval ecclesiastical parish of Bodfari and falling within the northern part of the commote of Dogfeilyn in the ancient commote of Dyffryn Clwyd. 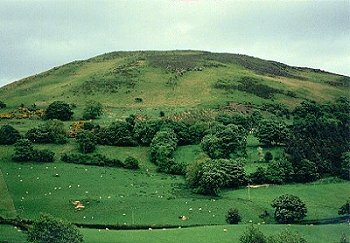 Steep middle slopes of Moel y Parc, part of the Clwydian hills, overlooking the Aberchwiler valley, between about 50-250m OD. The area mostly falls within the Clwydian Range AONB. Scattered smaller farms, cottages and smallholdings at or just below the spring line, along the moorland edge. Earlier buildings are built in local slatey stone, as in the case of the whitewashed farmhouses at Moel Parc and Ty-newydd. Possibly 17th-century stone farmhouse at Ty-draw, replaced by 18th-century farmhouse and outbuildings. Small to medium-sized, irregularly shaped fields from the margins of the lowland pasture up to the moorland edge, now predominantly improved or semi-improved grassland. Scattered larger trees and small small areas of deciduous and coniferous woodland on steeper slopes including Coed Draw and Coed Ty-canol. Coed Hendre-faenol, a small strip of woodland on the north-east, is classed as ancient replanted woodland (Walker & Richardson 1989). Fields generally bounded by grown out hedges, some represented by lines of taller oaks and ashes, some boundaries associated with low banks on the higher ground and lynchets on the slightly lower once ploughed land. Some abandoned fields, represented by old field banks and covered by bracken and gorse, on upper margins, on the north-west slopes of Moel y Parc. Representing piecemeal encroachment of formerly wooded areas probably during the later medieval and post medieval periods - Thomas Pennant (Pennant 1783, 27) referring to 'the lofty mountain Moel y parc, skirted with trees, contrasting itself to the softer part of the scenery'. 18th/19th-century bee boles for housing up to 12 hives are recorded near Aberchwiler. Winding lanes running either along the contours or steeply uphill, across the contour, to reach outlying farms, smallholdings and cottages. Lanes generally running in hollow-ways, some revetted in quarried stone.